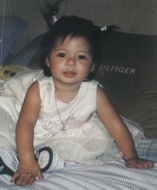 Suzie Marie Pena, a 19-month-old Latina, was shot and killed Sunday, July 10, 2005, in the 10400 block of South Avalon Boulevard in Green Meadows, according to the Los Angeles County coroner’s records. At 3:47 p.m., in response to a 911 call, police were dispatched to Raul’s Auto Sales, according to LAPD Chief William J. Bratton. The call had been placed by a teenage girl who said her father was threatening her. When officers arrived, they were met by the teenager and Jose Raul Pena, 35, who then went into the dealership and reemerged shooting, the chief said. Around 5 p.m. the young girl, identified as Pena’s stepdaughter, escaped. Once free, she told officers that Pena had ingested cocaine and alcohol and had threatened the entire family, who lived around the corner. About 6:20 p.m., SWAT team members fired at Pena again. Believing he had been wounded and was down near the door of his business, they moved in to rescue Suzie. Once inside, they discovered Pena was mobile and shooting at them from behind the wall of a small office. Officers returned fire. When the shooting was over, 60 rounds had been fired inside the small space, according to Bratton. Suzie, caught in the crossfire, was shot once in the head by a SWAT team member. Pena, shot multiple times, was found dead behind a desk in the makeshift office of his business. — Michelle Feb. 15, 2018 at 7:49 p.m.